NEW YORK, (March 9, 2018) –People are growing increasingly dependent on their mobile phones, tablets and other portable devices that help them navigate daily life. But these gadgets are prone to failure, often caused by small defects in their complex electronics, which can result from regular use. 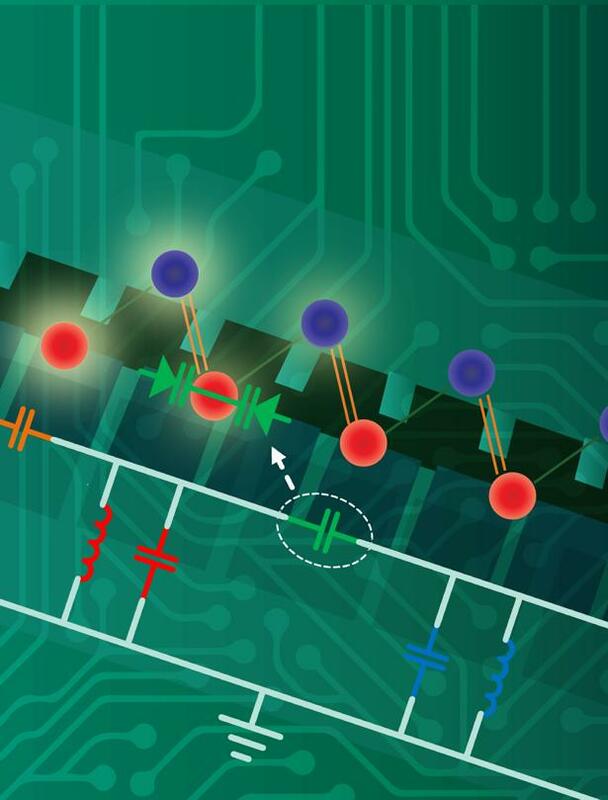 Now, a paper in today's Nature Electronics details an innovation from researchers at the Advanced Science Research Center (ASRC) at The Graduate Center of The City University of New York that provides robust protection against circuitry damage that affects signal transmission. The breakthrough was made in the lab of Andrea Alù, director of the ASRC's Photonics Initiative. Alù and his colleagues from The City College of New York, University of Texas at Austin and Tel Aviv University were inspired by the seminal work of three British researchers who won the 2016 Noble Prize in Physics for their work, which teased out that particular properties of matter (such as electrical conductivity) can be preserved in certain materials despite continuous changes in the matter's form or shape. This concept is associated with topology–a branch of mathematics that studies the properties of space that are preserved under continuous deformations. "In the past few years there has been a strong interest in translating this concept of matter topology from material science to light propagation," said Alù. "We achieved two goals with this project: First, we showed that we can use the science of topology to facilitate robust electromagnetic-wave propagation in electronics and circuit components. Second, we showed that the inherent robustness associated with these topological phenomena can be self-induced by the signal traveling in the circuit, and that we can achieve this robustness using suitably tailored nonlinearities in circuit arrays." To achieve their goals, the team used nonlinear resonators to mold a band-diagram of the circuit array. The array was designed so that a change in signal intensity could induce a change in the band diagram's topology. For low signal intensities, the electronic circuit was designed to support a trivial topology, and therefore provide no protection from defects. In this case, as defects were introduced into the array, the signal transmission and the functionality of the circuit were negatively affected. As the voltage was increased beyond a specific threshold, however, the band-diagram's topology was automatically modified, and the signal transmission was not impeded by arbitrary defects introduced across the circuit array. This provided direct evidence of a topological transition in the circuitry that translated into a self-induced robustness against defects and disorder. "As soon as we applied the higher-voltage signal, the system reconfigured itself, inducing a topology that propagated across the entire chain of resonators allowing the signal to transmit without any problem," said A. Khanikaev, professor at The City College of New York and co-author in the study. "Because the system is nonlinear, it's able to undergo an unusual transition that makes signal transmission robust even when there are defects or damage to the circuitry." "These ideas open up exciting opportunities for inherently robust electronics and show how complex concepts in mathematics, like the one of topology, can have real-life impact on common electronic devices," said Yakir Hadad, lead author and former postdoc in Alù's group, currently a professor at Tel-Aviv University, Israel. "Similar ideas can be applied to nonlinear optical circuits and extended to two and three-dimensional nonlinear metamaterials." The Graduate Center of the City University of New York (CUNY) is a leader in public graduate education devoted to enhancing the public good through pioneering research, serious learning, and reasoned debate. The Graduate Center offers ambitious students more than 40 doctoral and master's programs of the highest caliber, taught by top faculty from throughout CUNY — the world's largest public urban university. Through its more than 40 centers, institutes, and initiatives, including its Advanced Science Research Center (ASRC), the Graduate Center influences public policy and discourse and shapes innovation. The Graduate Center's extensive public programs make it a home for culture and conversation.